If you have a tween or a teen, you have probably noticed some moody behavior. Mood swings in children get more common during puberty. I am happy to have an expert today share more about moodiness – identifying signs and ideas on how to best handle moody behavior. 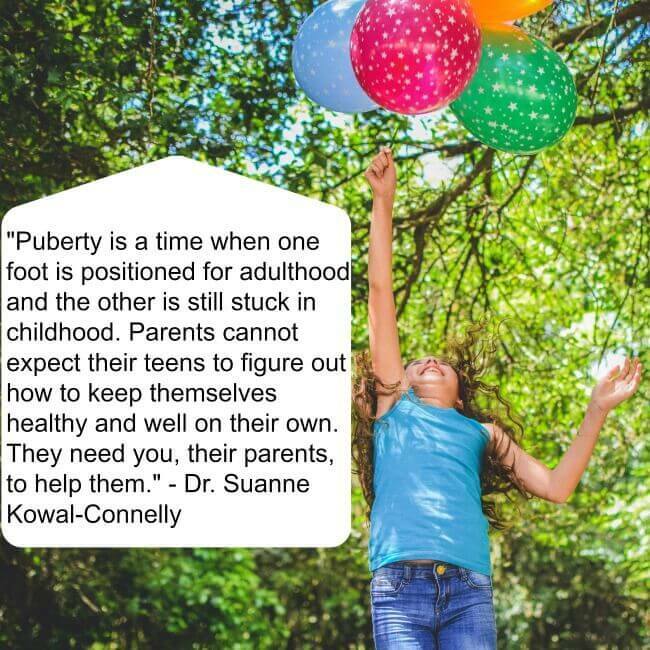 Puberty comes with many challenges and Dr. Suanne Kowal-Connelly’s new book PARENTING THROUGH PUBERTY: Mood Swings, Acne, and Growing Pains (affiliate link below) helps parents be ready and know how to respond to parenting challenges that may come up during puberty. From social media to cyber bullying and increasing environmental toxins, puberty today has lots of new influences to consider. “Puberty is a time when one foot is positioned for adulthood and the other is still stuck in childhood. Parents cannot expect their teens to figure out how to keep themselves healthy and well on their own. They need you, their parents, to help them,” says Dr. Suanne Kowal-Connelly. Mood swings in children can be a natural, normal part of adolescence but they should not just be completely ignored. They may be signs of a deeper problem or just a normal occurrence that still needs a little attention. Dr. Suanne Kowal-Connelly’s new book PARENTING THROUGH PUBERTY: Mood Swings, Acne, and Growing Pains offers valuable insight into navigating the trickiest stage of childhood development and is an indispensable resource for parents raising teenagers in the modern world. The book shares medically-based, easy to follow information, along with reassuring strategies, resources, and guidance to help every parent usher their child through puberty into a happy, healthy teenager. In the past, hormones were assumed to be the root cause of moodiness; however, we now believe moodiness is less about hormones and more the result of the imbalance between the frontal lobes and the limbic system. Discuss the science with your teen. Knowledge is power and arming your teen with information about the science behind brain development will help you both in understanding what is happening. It may help you to develop a better sense of empathy. Chances are your teen will be fascinated by this and will try to proactively control his or her reaction to things that he or she is sensitive about. Keep healthy sleep habits.oEat a healthy and balanced diet. -Maintain a balanced schedule for school responsibilities. -Encourage activities that teach mindfulness such as yoga, positive self-talk, controlled breathing, and muscle relaxation methods. Share your insights from this time in your life. A bit of humility can go a long way with your teen. When your teen gets moody, let him or her know that you had difficulties negotiating adolescence as well.Be relatable, be open, and be approachable. Remember that mistakes are teachable moments. All parents want to save their child from making mistakes, but errors in judgement and errors in life are opportunities to learn and grow. When children are terrified of making a mistake and disappointing their parents, it can lead to stress and moodiness. If your adolescent knows that you are someone that he or she can turn to without fear of looking weak or being considered a failure, it will be invaluable. A knee-jerk reaction by you to some of the things your teenager may share will only serve to alienate him or her and create a much moodier kid. Encourage your teenager to discuss fears and concerns. Brooding often occurs as a result of problems that an adolescent cannot solve alone. Let your teen tell you what those problems are and try to understand them from your teen’s point of view. Be a good listener and a nonjudgmental advisor. Most people don’t like to be lectured to, and teens particularly can’t stand it. Hard as it might be, try to remain quiet and listen intently to your teen.When you truly listen, you may find that a lot more is shared.Your relationship will be stronger, and the moodiness will be less. Ask permission to offer help, as opposed to telling your teen what to do. Often, it’s not what you say, but how you say it. Sometimes teens need to blow off steam and don’t always want or need you to say anything. However, if you always have something to say, your teen might become more moody or want to avoid you. Try asking permission of your teen before voicing your thoughts. If he or she says, “No,” as hard as it may be, just let it go for now. Ask your teen about solutions. Sometimes teens don’t want to talk, because they want to solve a problem for themselves. They want you to listen, but not to advise. They want to discover and figure out what to do on their own. Try to guide your teenager to self-discovery and praise his or her ability to problem solve. It will be a great moment for you both. Be ready to engage at any moment. This is definitely a hard one. The moment your teen wants to talk may not come at a time that is best for you. Be prepared to set aside what you may be doing so you can give your full attention to your teen. These talks can include the most heartfelt, crucial bits and pieces of what is important to your adolescent.He or she is looking for your guidance. You need to be available when he or she needs you to build that strong relationship and bond that will go a long way to helping your adolescent control his or her emotions. You should discuss with your pediatrician any time your child seems to have a negative mood for longer than 2 weeks. At any time that you simply feel something just isn’t right about your teen, trust your gut and have a talk with your doctor. It is always better to be on the safe side of these behavioral health issues. Have you been struggling with how to control mood swings? I hope you found this information on mood swings in children helpful. Check out Dr. Suanne Kowal-Connelly’s book for more on parenting through puberty! Oh god I have a 4 year old with an attitude at home nothing works for long. Thanks for these mood swing tips!